It was his humor that made Samuel/Mark famous. He was noted for his storytelling ability and biting wit. And very little escaped his lambasting. It struck me as I watched the documentary about his life that, other than his fame and success at actually publishing his work, Samuel/Mark was very much like me. It's not that I'm comparing my writing to Mark Twain's, but he seemed to view the world in much the same way I do. The older he got, the more disillusioned he got with life. And he used his humor to survive. 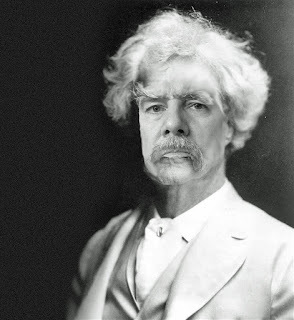 I have one advantage over Twain. I never achieved fame. Therefore I'll never agonize over losing it. I don't have to worry about whether my next book will be successful or as good as my first because I've never published my first. My failure as a writer does have that going for it. I wonder, though, if Twain had been born in this generation would he have created as much of an impact on the world as he did in the 19th Century? Sure we have mass media that could have blasted his words all over the world in minutes. But it seems impossible for anyone to focus on any one thing or person for more than 15 minutes any more (except for that lunatic buffoon in the White House). But I suppose if Twain had been on Twitter, he would have got a lot of retweets and likes. True that. I can't help but think that no writer will ever become as well-known in the future as those in the past few centuries. Great blog man. I'm entertained every time I come back. Thanks Emily! It always startles me to find out anyone is actually reading my blog. Glad you find it entertaining.